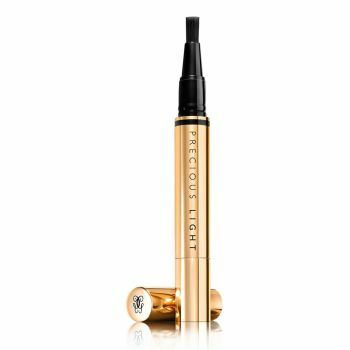 Like a magic wand, the Guerlain illuminator pen instantly erases dark areas and signs of ageing. Enriched with the Precious Rejuvenating Complex and lit up with Éclat d'Or Pigments, Precious Light reveals a revived and natural complexion. Day after day, it gives the skin a new youthful glow. In a few strokes of the brush, dark areas are illuminated. The face looks uplifted and rested. It glows with light and vitality. Signs of fatigue are diminished and the eye contour seems relaxed. The complexion glows with a rejuvenating halo, enhanced with subtle golden glimmers.